Irish cream espresso truffles are an easy no bake treat for St. Patrick’s Day. Spike the chocolate bites with Bailey’s for a festive flavor! St. Patrick’s Day is almost here, which means I get to bake with one of my favorite liqueurs—Irish cream. I usually have a bottle of Baileys in the apartment because you never know when your coffee will need an extra kick, which inspired me to make Irish Cream Espresso Truffles. 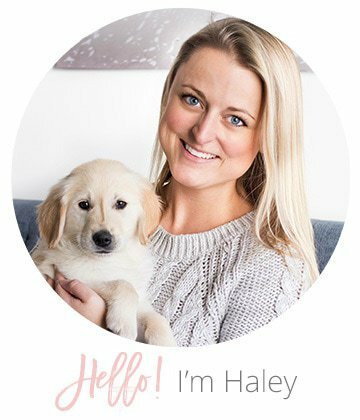 Plenty of recipes for Baileys truffles have made the rounds on Pinterest so what makes these truffles different? For one, I included espresso powder in the truffle mix, which was a natural complement to the Irish cream. Espresso also brings out the rich flavor of chocolate. Second, I was very aware of the consistency for the Irish Cream Espresso Truffles. I didn’t want them too soft because they wouldn’t keep their round shape, so I made sure the consistency was just tender enough to bite into and super smooth when consumed. The key to obtaining that silky consistency is to melt the chocolate with the Irish cream, then, once the chocolate is melted, add some extra fine espresso powder. I ground the beans in my coffee bean grinder , which has an espresso setting (score!). When the melted chocolate cools down, it reaches a consistency firm enough to scoop, roll and coat in cocoa powder—yum! 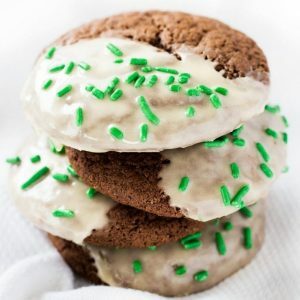 The Irish cream is of course the star of this St. Patrick’s Day confection. 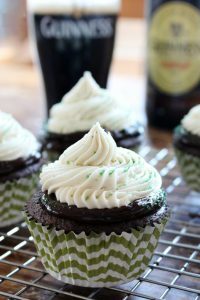 It doesn’t share the stage with whiskey and stout like with my Irish Car Bomb Cupcakes. The liqueur makes itself known in these bite-sized chocolate truffles, which is precisely what it should do on the Irish holiday. So make these Irish Cream Espresso Truffles, listen to Gerard Butler sing Galway Girl and have a very happy St. Patrick’s Day! In a medium pot over very low heat, melt together the semisweet chocolate, milk chocolate and Irish cream. Once most of the chocolate is melted, turn off the heat and add in the espresso and a pinch of salt. Stir until all the chocolate chips are melted and espresso is incorporated. When the mixture is cool and firm, scoop about a tablespoon of chocolate mixture and roll between your hands to form a one-inch ball. Roll the ball around in the cocoa powder until coated and place on a plate. Repeat until no more mixture remains. Store in an airtight container at room temperature. *Alternatively, you can place the bowl in the freezer for 20 minutes, or until the chocolate has little give when pressed. Mmm…these look divine! The espresso powder sounds like a great addition. Happy (early) St. Patrick’s Day! Thanks, Mara! Happy St. Patty’s Day to you too! Hi Mary – Yes, these can be frozen for up to 3 weeks. I suggest letting them defrost in the fridge to avoid any possible condensation. I also suggest rerolling the truffles in cocoa powder before serving. Enjoy! Should I add instant coffee powder? Hi Anna – Espresso powder is preferred and will add more coffee flavor, but instant coffee powder will work too.